One unexpected byproduct of the Trump administration has been the resurgence of Carl Bernstein and Bob Woodward. It’s not just that Watergate feels freshly relevant and impeachment is on tongues around the country. The two aging reporters are making vital contributions once more. Bernstein has contributed to several major stories, including the revelation of the Steele dossier. Now comes Woodward’s long-anticipated book on the Trump administration, and the first revelations, reported by The Washington Post on Tuesday, suggest it’s a doozy. Dishy, insidery books on the White House have become Woodward’s staple in recent decades, and is any White House as well suited to dishy, insidery accounts as Trump’s? Yet they are bound to land with a little extra force because of the source. The obvious analogue is Michael Wolff’s Fire and Fury, which created a splash when it was released in January. Yet while parts of Wolff’s book rang true, critics were able to poke some holes in others. Additional books about the White House have come from narrators who are unreliable, either because they have an axe to grind (Omarosa) or a relationship to sweeten (Sean Spicer). Woodward is not without critics, many of whom make valid points about his methods. But regardless of the means, he tends to deliver the goods. If there’s an overarching theme that emerges from the new revelations, it is the depth of the mutual disgust and disrespect between the president and his top aides, which is even more extensive than was already known. While some of the characters in Woodward’s anecdotes, including Cohn, Chief of Staff Reince Priebus, Staff Secretary Rob Porter, and National-Security Adviser H.R. McMaster, have already left the administration, Mattis, Kelly, Sessions, and Ross remain in top positions. 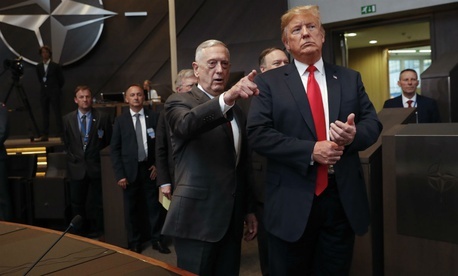 Woodward also claims that Mattis slow-walked an order from Trump to kill Syria’s Bashar al-Assad in April 2017, instead talking the president down to a set of airstrikes. That aligns with reporting by Patrick Radden Keefe in The New Yorker, who said Mattis appeased Trump by saying the Pentagon was working on things, then let them die quietly. For a man like Mattis, the defense secretary’s job seems to be a crowning honor in a decorated career, an act of duty to serve the nation, and a chance to help save the country from its president. Whatever moral qualms some Trump aides have about serving him, they believe, or tell themselves, that they are more able to prevent disaster by being inside the administration than they are by leaving. Assessing such claims, as a matter of fact or of morality, is difficult, though the anecdotes sources told Woodward seem designed to bolster them. And what about Ross and Sessions? The commerce secretary is an extremely wealthy man, and already an octogenarian. (One answer is that he seems to have enriched himself by taking the job.) The president’s derision of Sessions is even more excruciating. Sessions was one of Trump’s earliest and most steadfast supporters during the 2016 presidential race, but Trump has blasted him more or less constantly since the spring of 2017. Over the Labor Day weekend, the president attacked Sessions in astonishing terms, complaining that the Justice Department had prosecuted two Republican members of Congress for committing crimes.